Susie is a favorite daughter of the foundation cow of the Hillview herd, Belle Fourche Sparklett. Virtually every calf Susie has had, has been exceptional. She contributed prominently to the Hillview and Belle Fourche herds. 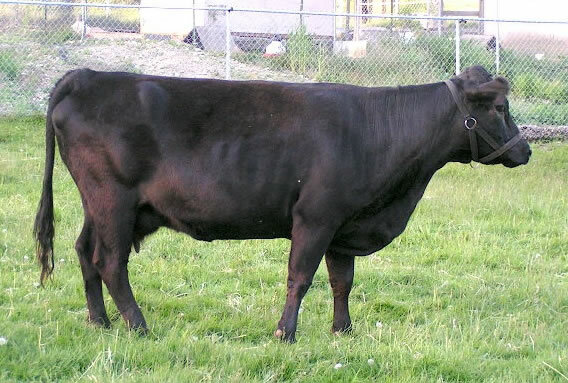 She then became a foundation cow of the Emerald Park herd in Washington. She is the dam of Hillview Red Wing and Mrald Overture, and the granddam of Belle Fourche Mr. Right – all prominent A.I. bulls. Her heifers and bulls have been a favorite in the show ring. Yet, the line produces very functional animals; fast-growing calves, udders that pass the test of time, solid conformation, and reliable brood cows with very tractable dispositions.